Like the Mabel Skirt, I bought the Myrtle pattern as soon as Colette released it...and then sat on it for months. I think my main stalling point was that the elastic waist and "self-lined" bodice would be too hard for me. I also worried that I wouldn't be able to turn the neck and arms under neatly enough and that the whole thing would look like a blind 4 year old with no thumbs had made it. In just over a year of sewing I still don't have much faith in my abilities and I try to keep things as easy as possible. 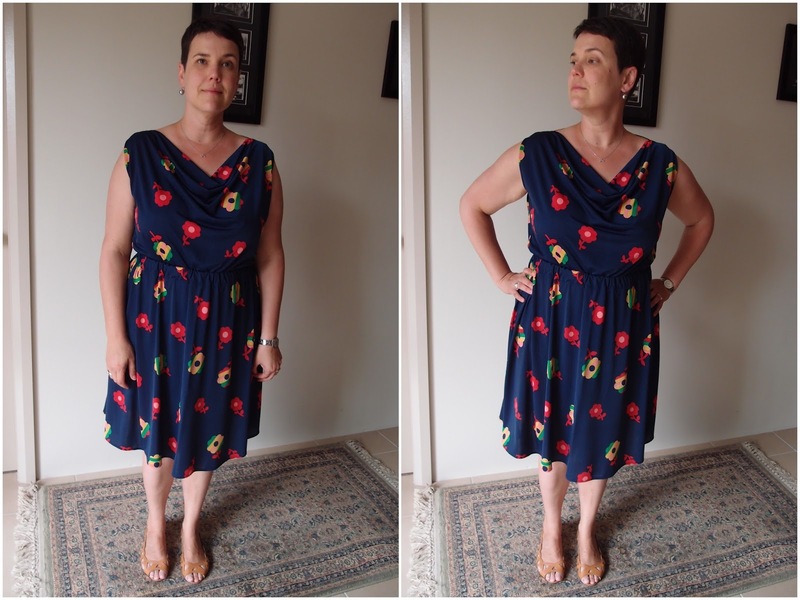 I absolutely love this dress, from the groovy fabric purchased from Spotlight to the cowl neckline to the blousey-ness of the bodice. This is EXACTLY the kind of dress I would buy if I saw it in store! All the love aside the armholes are just WAY too small for me to wear the dress and be at all comfortable. This is kinda upsetting as nearly every other blog post I've read on this make says the armholes are REALLY big. I think, thanks to sewing, I have now developed a mega complex that I have arms bigger than a X-mas ham! Excuse the shot of my armpit - but you see that I have nearly NO room under my arm...mucho uncomfortable! It also digs in at the front and back of the "sleeve". Whilst we're still on the topic of the ham-arms, I think that perhaps the pattern piece for the front/back bodice at the shoulders is a bit too wide? It's sort of like this dress can't decide if it wants to be sleeveless or have cap sleeves? I'm definitely going to make this dress again -- I just need to figure out how to make the armholes bigger whilst not stuffing up the pattern completely. An FBA has been suggested but I'm not even going to go there (plus it fits well across the bust). This make is a straight XL and I think in order to bring the shoulder width in somewhat I'll reduce from an XL to an L, or perhaps even an M from the shoulders to the underarm...and then I also just hack into the pattern at the bottom of the armhole to give myself an extra cm front and back...what do we think people? Is that a good or a bad strategy? Moving right along, the construction of the Myrtle is really easy. I had no trouble making the bodice at all and like I said I LOVE the cowl neck and blousey-ness of the front/back bodice. Very flattering on my figure I think. The instructions for this pattern were very good - very easy to follow and great for a beginner. 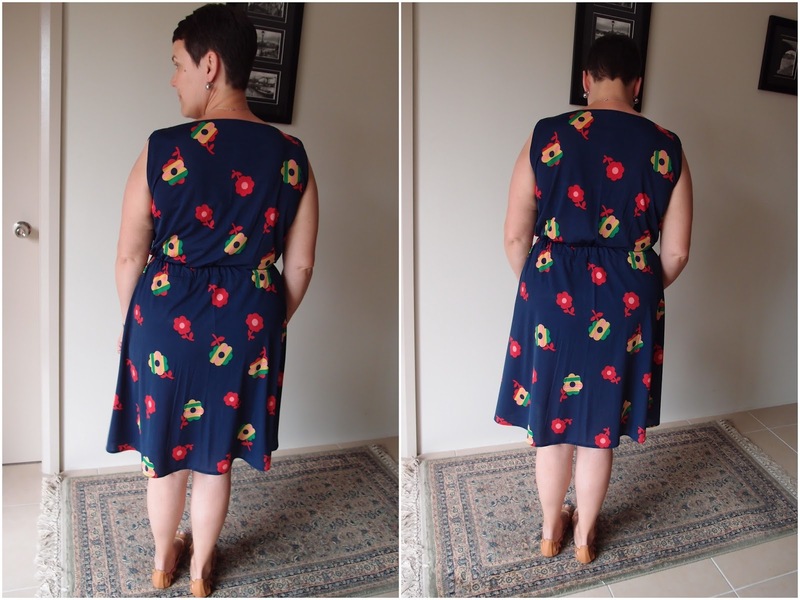 I had been worried about turning the neckline and sleeve hems of the back bodice under (they are not self lined) but this also proved to be a breeze thanks to my new BFF, Wondertape (bought from Addicted to Fabric in Canberra). I also thought I'd have trouble with the elastic waist, but this also turned out to be...not too bad. I inserted the elastic twice as the first elastic was very stiff and uncomfortable (it was a non-roll elastic). My second elastic is quite supple and does roll a bit so I've sewn down the elastic at each side seam to prevent it moving around too much. Next time I think I'll just sew the casing channel and then thread the elastic through, rather than trying to wrangle the elastic and channel and sewing all at the same time which is what the instructions suggest. That said, I'm wondering if I could forgo the elastic channel altogether and just sewing less wide elastic (or even clear elastic) onto the waistband as I join it to the bodice. I feel like that would be more comfortable. So there you have it. Even though this dress was a fitting-fail; I would call it a win in terms of sewing and construction. I'm happy I saw it through to the end as I think my work colleague would like this so it's not going to end up in the bin. 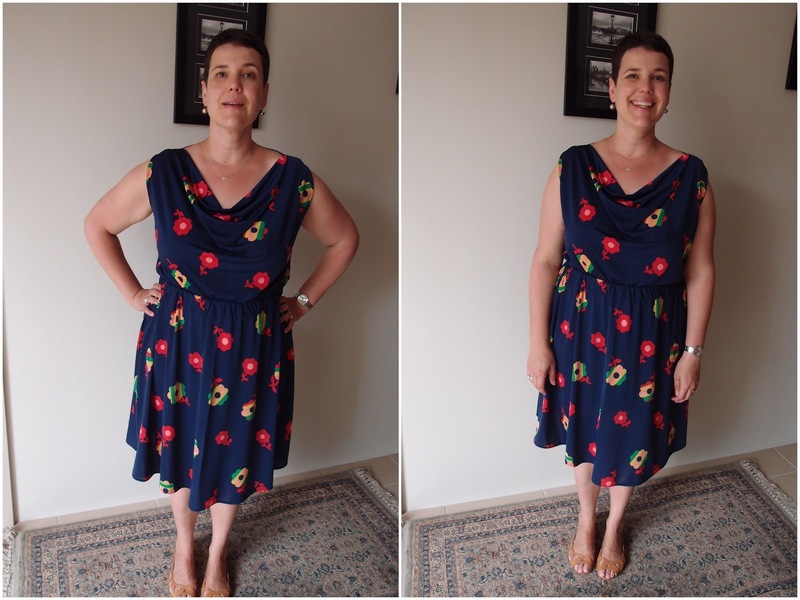 She wore one of other sewing fitting-fails to work the other day and I was super thrilled! Also, it's worth noting that if you get tired whilst you're out to dinner or at work whilst wearing this dress you can pull up the cowl and catch a few Zzzzz's. Changes for next time: lower arm holes to give more room; perhaps reduce the bodice size from the shoulders to the underarm fom an XL to L or M. Possibly look at changing method of attaching the bodice to the skirt with thinner elastic and no elastic casing (would reduce the whole dress to an L if I did this as it's very roomy without the elastic casing feature). I've been sitting on the Myrtle pattern too, but your make has inspired me to get cracking with it. To fix the arm holes, simply cut them to approx wear you want them, with about 1cm extra. Then turn back under and stitch. Actually, you said the bodice is lined. Did you sew it right side together then flip back around? It may be a bit messy just to trim and re-sew, but it should still work. If you do sew it right sides then flip around, before you sew it next time, just trim the outer and lining a little, deepening the arm and reducing the extra wide sleeve caps. Regarding the elastic, next time you make it, don't sew the channel. Just sew the bodice to the skirt and zig zag elastic to the overlocked seam. This will pull the dress into the body without the channel. Also you don't have to use clear elastic, I often find it hard to sew neatly, just regular thin braided elastic works fine. It looks great and just think about the possibilities. You can make a stack of these for sunner! Mel, this is tops! I love this print! I agree with Christy- redraft those armholes and add a SA then you should be good to go :D Well worth a repeat make! Looks fabulous! Nothing beats a good crumb-catching cowl in my book. You have come such a long way & even just puzzling things out shows that you are already getting there. I think Little Betty has offered you great advice. Good luck with No.2. I love this fabric and dress combo, it's gorgeous!! I am no help with the fitting issues, I will gladly admit to being useless in that regard. But I do hope you find a solution as it's a great dress on you! This is a great dress on you. Can't wait to see the next one! Once the bodice is sewn and ready to try on you're really stuck with what you've got due to the way it's constructed. Susan helped me out with the armholes/pattern on Sunday and I'm *just* about to cut into my next lot of fabric for Take 2! Wish me luck. The fabric is SO lovely and I'm super lucky that Spotlight had more of it...so I have more in my stash to make this dress up again. I've had a friend look at the armholes whilst the dress is on me and she's worked out the adjustments for me....I'm lucky to know someone who's a professional fashion designer/pattern maker that's for sure! Fitting issues are THE WORST. Someone pointed out to me the other day that sewing is one skill; but fitting is whole other skills. Ain't that the truth. I think I could store a whole loaf of bread in my cowl...mmm, bread. Susan helped me out with a pattern alteration...very simple, and what I thought I should do anyway, but I'm confident that the next one will work now that she's looked at it. Fabric is SO gorgeous and I'm lucky to have been able to pick up a few more meters of it recently. Phew! Good idea re the armhole size...fitting sure is difficult! Thanks for the advice! I've got my pattern all ready and am about to cut out my next version. The bodice is self lined...so the front is basically a double of itself. I've cute the armhole a bit bigger and we'll see how that goes *fingers crossed*. It's a super cute dress! I'm looking forward to attempt #2..and #3 whilst we're at it! Awesome! I look forward to seeing it. Learning to sew is a long journey, but it's so feel so good when you do make great items that fit well! Good luck! Anita Ponti Pants OF JOY!